I have listed the list of free online logo makers below. By using following websites you can create professional logos for your blog/Websites. There is no need to install any software to create a logo. You can directly create a logo online within some very easy steps. So have a look to the following list. Logo Factory is the best websites to create logos for your products or company for free. I really don’t like the interface and design of this website as it contains too many ads. New user gets confused about where to create a logo. But still this website provide good options to create a logos so I am listing it here. Cool Text is another great website which provides FREE graphics generator for web pages and allows to create an impressive logo without a lot of design work. This website have an options to choose what kind of image you like and you can create a logo using those images. Very simple to use and free for all. 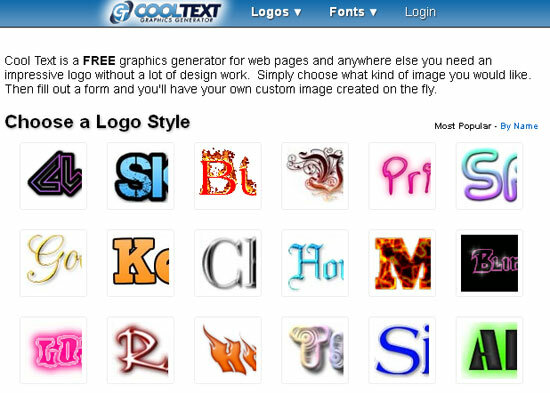 This is another cool website which allows you to simply create logos by entering your text, select your options and you have a logo!-Gives a web 2.0 look. Visit this website and create some logos as it is absolutely free to use. Offers you a good background texture for your logo and has several others to choose from. Over 200 fancy font types to choose from! Change the background color.Can choose shading color too. Offers 2D logos,3D logos and Animated logos.One of the best logo makers with many configuration options. We can choose from different templates as background for our banners.Good for Website banners. Just follow the three easy steps listed above to create your logo.